CHESHIRE – During a brief presentation Tuesday morning, State Representatives Craig Fishbein (R-90) and Lezlye Zupkus (R-89) were joined by Rep. Liz Linehan and principal Scott Jeffrey to honor Jake Tierney, for his women’s history month essay on activist Anne Stanback and runner-up Mairead Hall for her essay on former Gov. Ella Grasso. Cheshire legislators presenting Mairead Hall with an official state citation. Cheshire legislators presenting Jake Tierney with an official state citation. 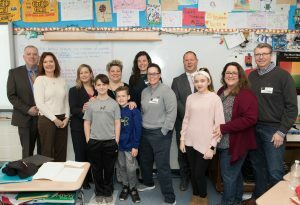 Highland School Principal Scott Jeffrey, Rep. Lezlye Zupkus, Rep. Liz Linehan, essay contest winner Jake Tierney, his brother Milo Tierney, both of his mother’s Tracy Tierney and Katherine Tierney, and friend Patricia Shugrue, Rep. Craig Fishbein, essay contest runner up Mairead Hall, her parents Katherine Hall and Mark Hall. 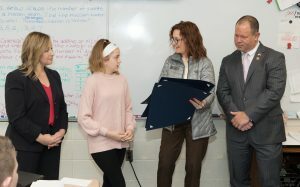 The Women’s History Month essay contest titled, “Important Women in Connecticut’s History and How Their Contributions to the State and Nation Affect Me,” was organized by Reps. Zupkus and Fishbein to honor Women’s History Month. 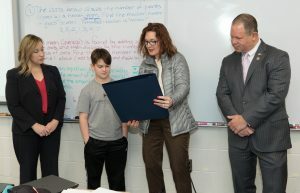 During the presentation before their 6th grade classes, both Jake and Mairead were given official state citations and explained why they chose the subjects to write about before posing for pictures with parents, the legislators, school officials and classmates. “Each year, I continue to be amazed with the exceptional writing by these young students and this year was no different. The final two essays, especially Jake’s essay displayed a heartfelt, inspiring story and message,” said Rep. Zupkus.